Plans for two residential towers in Shoreditch have been rubber-stamped by Hackney Council. The One Crown Place scheme, to be built by developers Alloy Ltd, will see a pair of towers reaching 29 and 33 storeys containing 247 high-end apartments but with no provision for affordable housing. The development, designed by Kohn Pedersen Fox (KPF) will include a podium of office and retail space beneath the residential towers and a 32-bed hotel. In planning documents, Islington Council suggested that the 19,000 square metres of office space represented a “missed opportunity” to provide further relief to the City’s problem of office space shortage, by replacing potential offices with luxury apartments. It also expressed concern that the “warm colours” of the towers’ cladding will clash with the pale Portland stone of the Finsbury Square Conservation Area, and expressed doubts that ‘the palette of materials will age well’. 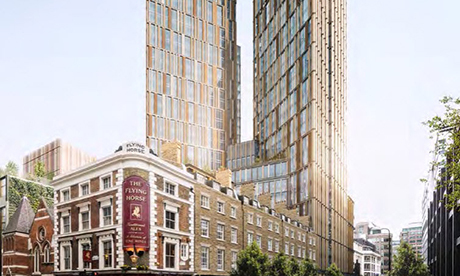 The London Stock Exchange (LSE) agreed with Islington Council that the proposed design might threaten nearby Conservation Areas, calling the 33 storeys an “excess”. But others think the height is acceptable for the City Fringe location of One Crown Place. Speaking on behalf of the campaign More Light More Power, which formed in opposition to the Bishopsgate Goodsyard scheme, Andy Kanter said: “This is a much more of an appropriate place for this kind of building than others we are concerned with”. Beds and Bars Ltd, which manage the Grade II-listed Flying Horse pub on the Wilson Street side of the plot, said they were “happy” with the proposal, and expect the new development to be “great for business”. In place of on-site affordable housing, the developers have offered a cash payment to Hackney Council of £8 million toward the construction of 38 affordable homes, as well as further payments toward accompanying infrastructure totalling over £1 million. According to Nick Perry of the Hackney Society, who was present at the planning sub-committee meeting, concerns were raised about how it could be demonstrated that any new homes had been built as a direct result of the payment. The proposed location of the off-site homes also remains uncertain, although some committee members favoured a site in the south of the borough, near the site of the development itself. Dato Azmil Khalid, President and CEO of AlloyMtd Group said: “We’re delighted that Hackney members see One Crown Place providing positive benefits to this part of London including new jobs and workspaces, additional housing provision with a big contribution for affordable homes as well as creating a brand new destination for Shoreditch”. Hackney Council praised the development as “a positive addition to the London skyline”. The site, which is currently disused offices, was squatted by members of protest group Occupy London for their “Bank of Ideas” in 2011. The proposed development will include 938 cycle parking spaces, and no parking spaces for cars.